So much has happened over the course of the past two weeks that the only way we could even approach it all is to simply throw it up here on the Blog and let it ride ! "County Recurrent" took a trip to Southern Section earlier this week, and frankly, it was such a beautiful day in Manhattan Beach that this life long Central Section recurrent paused and said to himself, "Wow ! Why am I not working here !?"... You can see for yourself in the two photos above from this past Tuesday, Oct. 20 at noon..... The reason for the trip was a business lunch scheduled at LACo Recurrent, Chris Bredesen's Manhattan Beach Restaurant, "Memphis At The Beach." Which is highly recommended ! Just check out the special Calamari Salad and the Bison Burger (as opposed to Moose, no relation to Jay Butki...). By the way, don't know if I told you I am working permanently here in Washington DC at Army Corps HQ (todays my first day on new job). My new job is to help coordinate coastal, navigation, and flood control projects in the southeast US between the folks doing the work at the state level, our Division office in Atlanta, and folks here at HQ where the decisions are made. Got some interesting studies I am helping with including Savannah Harbor (big harbor deepening study), ACT/ACF (involves 3 states sharing water), Florida beaches and harbors, etc. It's a big move for the family from Florida I can assure you. We are busy settling in, kids in their new school, moving our stuff to DC, fixing up our Florida house, etc. Taking the subway to work is a change - do miss the beach - a lot. Nice hiking and kayaking, here. Nice to be back in a big city except for the housing expense and commute. All trade offs! 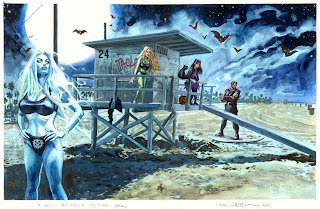 Hope you are doing well - keep sending the lifeguard related emails - I love em!" 2. Cal Porter reports that there are a couple of new stories he's written on his blog. Per Cal, the best way to find him online is to google his name. Strange thing is when I try that with the name "Phil Topar" all I find are references to "Vegetarian" restaurants and "Skin Moisturizers"... but that's another story. 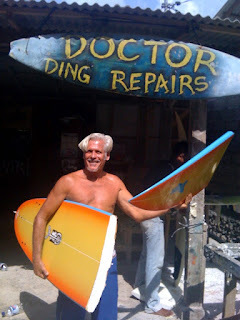 In any case, go see Cal's blog ! 3. 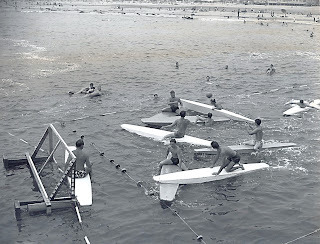 Arthur Verge, Phd, a Central Section recurrent now working southern section.....sent us the following b/w photo of a group of paddleboard water polo players back in the day, which according to Arthur's dad, Art, was a big time sport amongst the beach lifeguards in the 40's and 50's. 4. 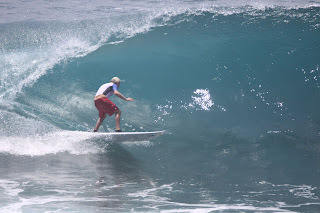 Kip Jerger has sent us some more great recent surf shots from Bali. 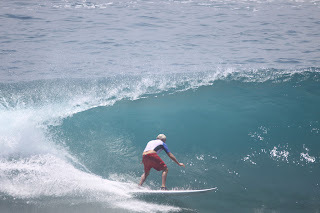 Just check out this sequence of photos showing Kip rippin' it up! 5. Bob Burnside has a short monoski video that features some great footage of Utah powder. Contact Bob at: monoskibob@earthlink.net to see this video. 6. LACo Capt. Angus Alexander gave us a heads up of an online YouTube video of "Jack The Rescue Dog", wherein a very talented Lab rescues a guy who should not be in the ocean... woo hoo ! You can see this video by searching "Jack the Rescue Dog" at www.YouTube.com. 7. Joel Gitelson recently reported the profits earned at the recent Manhattan Beach Home Town Fair from the South Bay Surf Club's annual "Fish Taco Booth", which "County Recurrent" recently blogged about. THANKS TO CHRIS BENNETT OF GOOD STUFF RESTAURANTS FOR ONCE AGAIN DONATING 2500 CORN TORTILLAS! CHRIS, YOU’RE AWESOME! OUR TAKE TO THE CLUB WAS $4,683.23 !!! ENORMOUS THANKS TO EVERYONE WHO HELPED." 8. File under "On the Verge of Another Coincidence. The undersigned Editor of County Recurrent bumped into Art Verge, Ph.d (Senior), Prof. 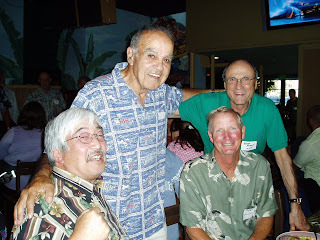 Emeritus, History, Santa Monica College and former Santa Monica City beach lifeguard yesterday morning at Callahan's Restaurant on Wilshire Blvd. in Santa Monica. As the photo below shows, Art stopped by for his morning breakfast routine of a bagel, cream cheese and coffee and had in his possession a b/w reprint of the Naval Ship he served on during WWII, which he is going to use as a prop in an upcoming Kiwanis Club presentation. (Caveat: We think Nick Steers goes to these 'boondoggle' drink fests too). And then this breakfast of yesterday takes another coincidental turn. The guy at the next booth sees the photo of the ship and takes some interest in it and mentions that he was in the Merchant Marine. I think, "Dennis Wells", the former S.M. City and LACo Recurrent, Class of 1974, who left lifeguarding to pursue a career in the Merchant Marine. Turns out this gentleman diner, Achim Huber, knows Dennis Wells, and furthermore, Achim's stepfather was our own Wally Reeves, (R.I.P. 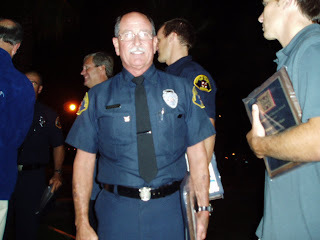 ), the famed L.A. City and LACo Boat Captain for many years. Wally has since passed away and Achim is hoping that we all can locate any photos any of us may have of Wally so that Achim can give them to his mom who still misses her husband Wally very much. Please join us for the 2009 Professional Lifeguard Foundation Donor Recognition event. We welcome all previous and future donors. "The final story of interest and of Historical fact was during the National /International Championship finale. 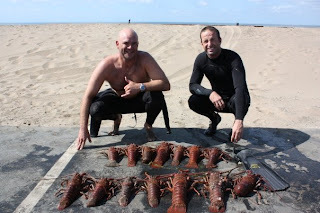 Although the boys were doing quite well in open water ocean swims, they were getting beaten repeatedly in the belt race. 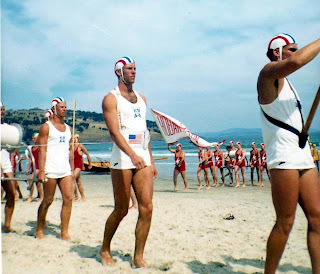 The belt race included one swimmer putting on a belt, attached to 300 yards of cotton line...he would then swim to a buoy, with the assistance of three other team members on the beach. They would feed the line out carefully to their swimmer as he raced seaward. The First swimmer to his buoy would raise his hand...declaring his win. 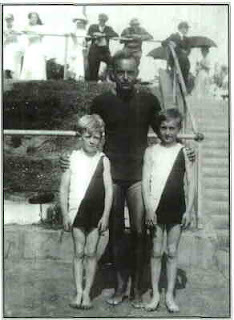 I had two outstanding junior swimmers… Spike Beck and Bi Gerold. Rudy had alternated between each...with no success from either of them. 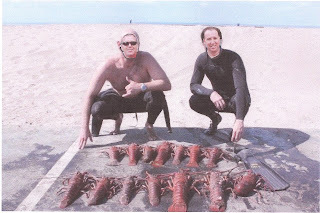 A week before the Championships, we were in Queensland. An old Lifesaver approached me on the beach as we were training for the belt race. He looked at the reel and belt...fingered the line and said, ”Mate, you Yanks have been had! Your line has never been waxed, no wonder you’ve lost every race” He then explained that lines needed to be stretched and waxed so as to better float with ease. Salt water soaking into the cotton line made it sink and become very heavy to swim with. 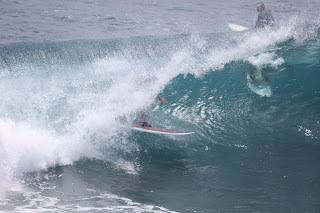 He also informed me, if not stretched...the line would bow in the current while racing. He then made an offer to me saying... “If you’ll trust me with the entire reel, I will have it properly stretched and waxed and have it ready for the Championships for you.” I accepted his kind offer.....and it was ready for us just before the final championship in South Australia. Rudy and I discussed which of our juniors would race in the Championships...Bi was fast, but I argued, ”Spike is all upper body strength and is a fighter...and he’ll give his all to beat these Aussies”. Rudy agreed...and we went with Spike Beck in the finals. As we strained our eyes to see his lane and if his hand would rise first...a roar from our team went up... Spike Beck had won the National Australian Junior Belt Race... Something no foreigner had ever done...and to this day that feat has never been duplicated. 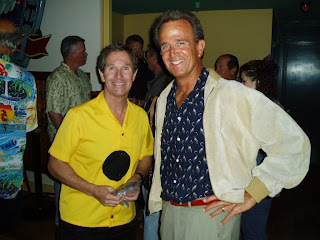 And below, Spike at left, with Central Section Chief, Micky Gallagher, in August 2008 at Jim "Jake" Jacobson's Retirement Party. George loved his Victorian State Lifesavers...and one evening after dinner, Bud Stevenson and I listened to the Silver Fox propose an exchange competition between our “Los Angeles County Lifeguard Association” and his Victorian State All Star Team. 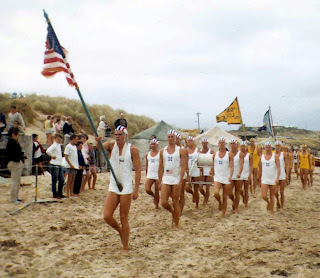 He stated, ”If we stay away from each of our National Boards, it is acceptable that separate exchanges can be formulated between individual Lifeguard associations.” Bud and I agreed that this could easily be accomplished. 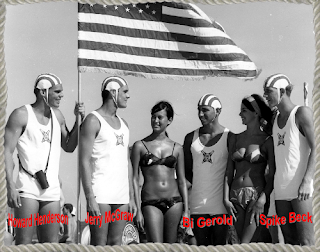 We would set up a Race similar to that which the County of Los Angeles put on annually called “The Taplin Bell"... a relay of four swimmers, four paddlers and finally four dory teams. 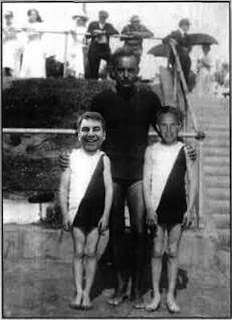 Our Taplin Race had been named after a Hermosa Beach Judge “Judge Taplin”, so “The Silver Fox” said, ”Great mates! Let’s call this event between our two Associations “The Weiland Shield”, after the Australian Ambassador to the USA...a close friend of Nutbean. 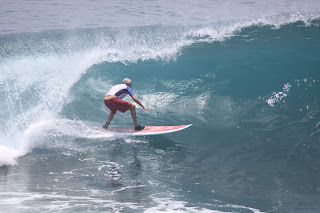 We would drop the dory segment of the race and in its place put the Australian Surf Ski...It was perfect and today “The Weiland Shield” is hotly contested every two years...either here on the California Coast or in Victoria, Australia. The next year, the first Victorian Team arrived in California and was hosted by us. Since then every other year...an L.A. County all-star team journeys to Victoria, Australia, and they...every other year come to the United States. Today this exchange remains the highlight of competition between the two countries. 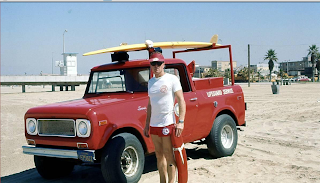 "The Silver Fox” has since passed on, but he left behind a legacy and an exchange program, for “His beloved lifeguards...both Aussies and Yanks", who will enjoy it for centuries to come. Hopefully, he and I will again tip a “Schooner” of beer together...on yet another beach somewhere beyond...and discuss other exciting projects. We had had a tremendous tour...and cemented a lasting friendship with our “Down Under Counterparts.” In the years to follow, many tours have been exchanged, to the benefit of all the past, present and future young men and women now part of the International Family of Lifeguards. We had been gone for over two months! Visiting, Auckland New Zealand, and all the States in Australia: New South Wales, Queensland, Victoria, South Australia, and Tasmania and now were on our way to Hawaii for a short relaxing vacation before returning home to California." On behalf of "County Recurrent" and its readership, we would like to express our sincere gratitude and thanks to Bob Burnside for sharing these great lifesaving competition stories and photos with us ! 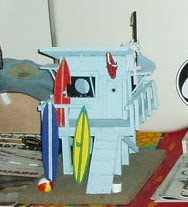 "Save A Lifeguard, Eat A Fish Taco !"